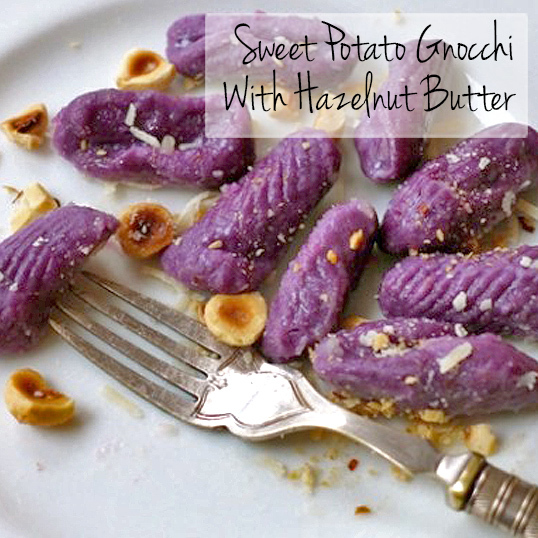 “I’ve written separate formulas for purple and orange sweet potato gnocchi to account for slightly different proportions of flour-to-potatoes, depending on the varieties. The orange types will absorb more flour, but they, too, will be delicate and fluffy as long as the potatoes are not freshly harvested and have had a few weeks to age. When making sweet potato gnocchi for the first time, prepare a small batch as described here, and practice forming the dough and rolling out the dumplings once before making a larger batch. No doubt it will occur to you to make both types for a dramatic two-colored effect, certainly a lovely presentation.” Continue reading on Zester Daily. Ingredients for the dough include Stokes Purple® Sweet Potatoes (or regular sweet potatoes), flour, navel orange, nutmeg, and sea salt. As for the sauce, you will need butter, hazelnuts, and grated Parmigiano-Reggiano cheese. Once formed, the gnocchi can be left out at room temperature, uncovered, for up to two hours, or frozen in place in an ample deep-freeze. Once frozen solid, slide gnocchi into freezer bags and freeze up to 3 months.